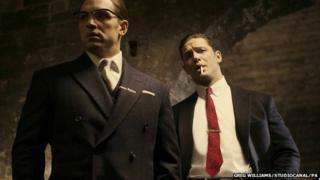 The first image of actor Tom Hardy as the infamous Krays has been released as filming gets under way on a new movie about the notorious London gangsters. The 36-year-old is taking on both roles as twins Ronnie and Reggie in Legend, which follows the rise and fall of the brothers in the 1950s and 1960s. British stars Christopher Eccleston and David Thewlis, Australian actress Emily Browning and A Bronx Tale's Chazz Palminteri are also confirmed to star. It is expected to be released in 2015. In April, when Hardy was confirmed in the roles, he said: "I've got to work out how to play both twins, which will be fun. "It's another experiment and I'm really looking forward to it. I'm not going to put too much pressure on myself, I just want to have some fun and see what's out there and explore with the work." Based on John Pearson's book The Profession of Violence, Legend is written by Brian Helgeland - who won an Oscar for writing 1997's LA Confidential - an adaptation of the novel by James Ellroy. Ronnie and Reggie Kray were infamous for their involvement running organised crime rackets in London's East End and were both jailed for life in 1969 for the murders of fellow gangsters George Cornell and Jack 'The Hat' McVitie. Ronnie died of a heart attack in prison in 1995, while Reggie died of cancer in 2000, eight weeks after he was granted release on compassionate grounds because of his illness. The twins were previously depicted in a 1990 biopic starring Spandau Ballet's Gary and Martin Kemp.